The Romance Cover: Blog Tour ~ Spotlight on Devotion by Nicole Edwards & Giveaway! 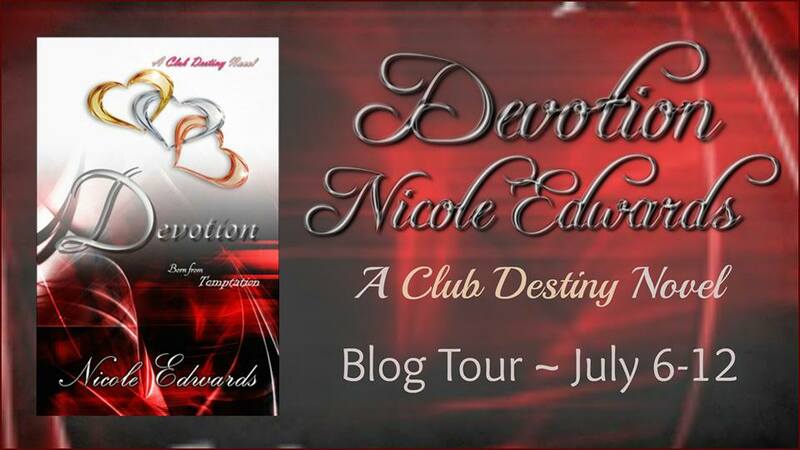 Blog Tour ~ Spotlight on Devotion by Nicole Edwards & Giveaway! Devotion is book 5 in the Club Destiny Series by Nicole Edwards. Devotion is the follow up story of Luke McCoy, Sierra Sellers and Cole Ackerley from Temptation and should not be read before Temptation. For two very complex, very alpha men, life after love isn’t necessarily an easy thing to embrace. Although Sierra Sellers is, and will always be, the lifeline between Luke McCoy and Cole Ackerley, every day life proves to be the true test of the bond the three of them have forged. No one ever said that life was going to be rainbows and butterflies after the three of them admitted their love for one another. Between their own personal insecurities, a relationship that falls well outside what most people consider traditional, and a baby on the way, the three of them find out that there are still going to be a few ups and downs. With insecurities comes doubt, and no matter what obstacles fall into their paths, the one thing the three of them aren’t willing to sacrifice is their devotion to one another.